The Great Sphinx of Giza (Arabic: ‎ Abū al Hūl, English: The Terrifying One), commonly referred to as the Sphinx, is a limestone statue of a reclining or couchant sphinx (a mythical creature with a lion's body and a human head) that stands on the Giza Plateau on the west bank of the Nile in Giza, Egypt. It is the largest monolith statue in the world, standing 73.5 meters (241 ft.) long, 19.3 meters (63 ft.) wide, and 20.22 m (66.34 ft.) high. It is the oldest known monumental sculpture, and is commonly believed to have been built by ancient Egyptians of the Old Kingdom during the reign of the Pharaoh Khafra (c. 2558–2532 BC). The Great Sphinx is one of the world's largest and oldest statues but basic facts about it, such as when it was built, and by whom, are still debated. These questions have resulted in the popular idea of the "Riddle of the Sphinx," alluding to the original Greek legend of the Riddle of the Sphinx. 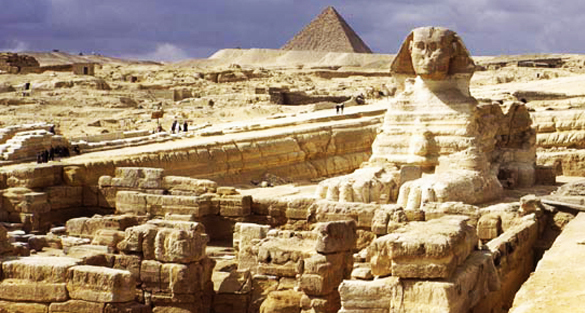 Pliny The Elder mentioned the Great Sphinx in his book, Natural History, commenting that the Egyptians looked upon the statue as a "divinity" that has been passed over in silence and "that King Harmais was buried in it". It is not known by what name the creators called their statue, as the Great Sphinx does not appear in any known inscription of the Old Kingdom, and there are no inscriptions anywhere describing its construction or its original purpose. In the New Kingdom, the Sphinx was called Hor-em-akhet (English: Horus of the Horizon; Hellenized: Harmachis), and the pharaoh Thutmose IV (1401–1391 or 1397–1388 BC) specifically referred to it as such in his Dream Stele. The commonly used name Sphinx was given to it in classical antiquity, about 2000 years after the accepted date of its construction, by reference to a Greek mythological beast with a lion's body, a woman's head and the wings of an eagle (although, like most Egyptian sphinxes, the Great Sphinx has a man's head and no wings). The English word sphinx comes from the ancient Greek Σφίγξ (transliterated: sphinx), apparently from the verb σφίγγω (transliterated: sphingo / English: to squeeze), after the Greek sphinx who strangled anyone who failed to answer her riddle. The English word sphincter comes from the same root. The name may alternatively be a corruption of the ancient Egyptian Ssp-anx (in MdC), a name given to royal statues of Dynasty IV (2575–2467 BC and later) in the New Kingdom (c. 1570–1070 BC) to the Great Sphinx more specifically, although phonetically the two names are far from identical.